On April 2nd, 2019, the world said goodbye to Google+, a social network created by the search engine giant. In the tech world, this isn’t the first time for an entire social platform to disappear. We saw it when Vine, a 6-second video platform shut down, as well as when MySpace faded away. In other words, when you place a lot of your effort into a platform you can’t control, it’s important to be prepared for the circumstances in case it disappears someday. Size of the user base of Google+ was hardly comparable to that of Facebook or even Google’s own YouTube. Almost half of US internet users never visited Google+ as of 2018, and Google+ held less than 0.3% of social network market share in the UK. But Google+ was incredibly valuable to many users around the world. The reason? Private Google+ communities. They provided a protected online space for coworkers to share knowledge and distribute intelligence, industry news, and key information in a timely manner. This was easily amplified for companies that already used G Suite products and accounts as it made their Google+ accounts exist by default. In general, private Google+ communities were groups created for like-minded individuals to collaborate, discuss common interests, and share relevant links. 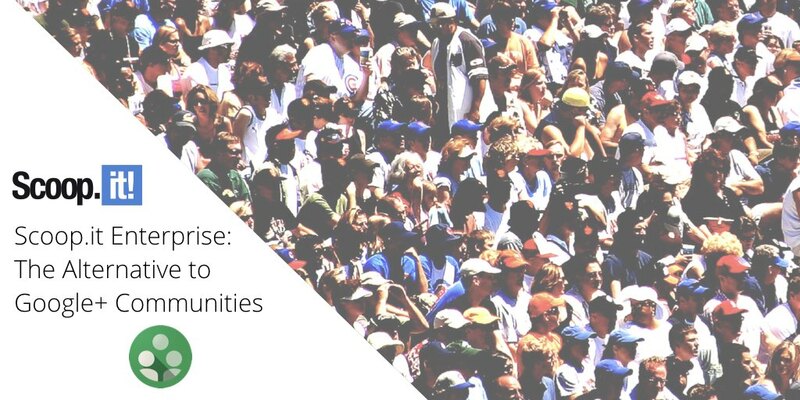 When you applied that to a company environment, these communities provided a great platform to encourage rich, media-filled interactions, comments, and feedback. This system made it simple for people to simply share new and important information with team members or the entire company without having to send emails. It also enabled those on the receiving end to comment and take key actions when necessary. And now, just like that, this platform to share knowledge with coworkers safely and privately is gone. Knowledge is power. Each employee of your company brings something unique to the table and taps into various resources to do their job the best they can. If you don’t have a collaborative, customizable solution for them to curate and share their knowledge, they won’t be able to positively impact your organization. They won’t be able to empower their team members or other teams the way they want to. This is a lot to have to think about on a daily basis. And all of that on top of an already demanding workload! Automated content discovery. 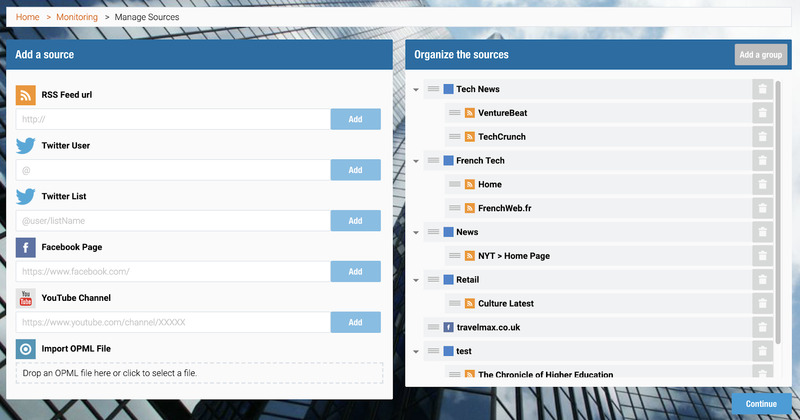 You can add important sources through RSS feeds and social media monitoring. You can also keep tabs on important keywords and receive daily or weekly email alerts on specific topics and content formats. Engaging, dedicated content hubs. 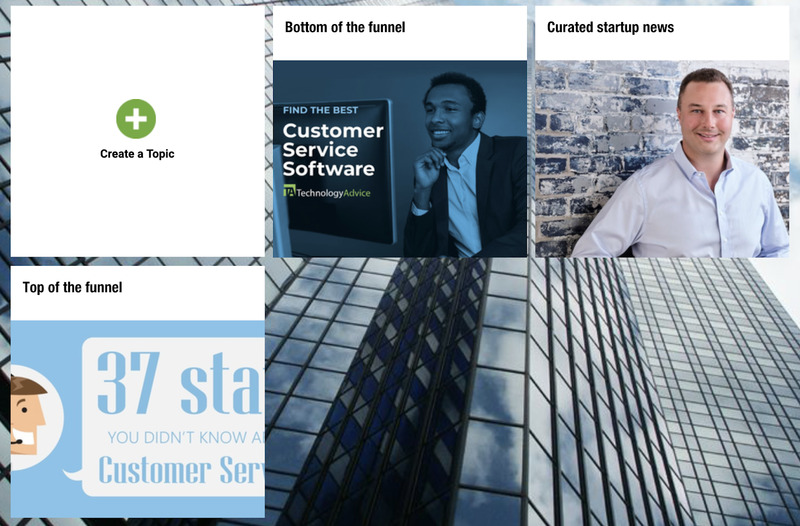 Each team, project group, or topic can have its own topic page—a content hub. This way, instead of hoping the key piece of information reaches the crucial person in your company, you can arrange hubs tailored to specific purposes so nothing gets lost in the noise. Comments and collaboration. No more mass emails and reply-all disasters. People that need to share ideas based on an article someone shared can do that directly within the same space. Distribute knowledge using email. Are you spending your valuable time scouring your emails and notes to email daily or weekly recaps to your team or company? 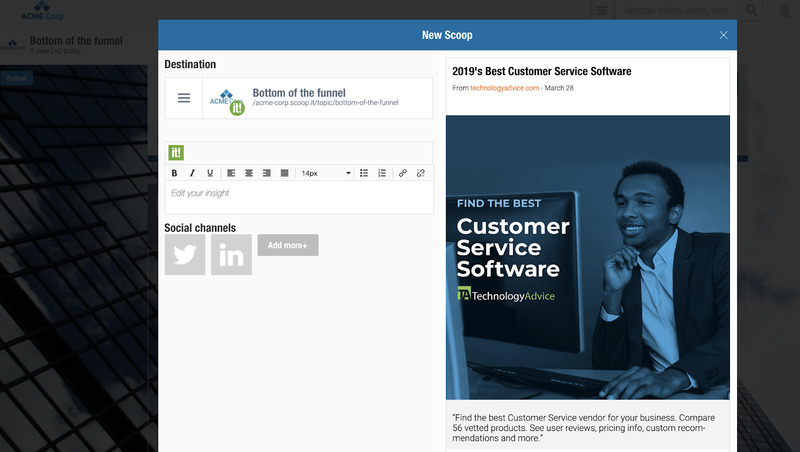 With Scoop.it Enterprise, you can drag and drop curated topics based on tags and filters and use customized templates to make them easy to scan and read. PR teams are responsible for the world’s image of your company, so it’s essential for them to have instant access to all public commentary and news about your organization. There are two ways you can make sure your public relations team can easily keep tabs on this type of fast-moving information. Secondly, you can create a content hub that is only dedicated to articles and news about your company and give access to everyone in your company to add links and documents to it. This way, your PR team can rely on all employees to be their eyes and ears! Sales and marketing can’t really perform well without each other. Marketing is responsible for bringing in the best leads, and sales reps are in charge of converting them into customers. When these teams work in tandem, the result is predictable revenue and a steady growth. In order to make both teams empower each other, create a space for the marketing team not only to share useful content for the sales team, but also the space to customize their insights. For example, let’s say you sell customer support software. You could create two content hubs—top of the funnel and bottom of the funnel—and allow the marketing team to add content for sales people to use in conversations in these two key stages of the customer journey. While there are many more use cases for private knowledge sharing, one thing is for sure: when employees are encouraged to curate and share fresh information about the industry, competitors, market trends, and customers, you can always take data-driven action. With the right tool in place, you can create a system that allows everyone to their teams and wider company goals based on their sources, skills, and connections. 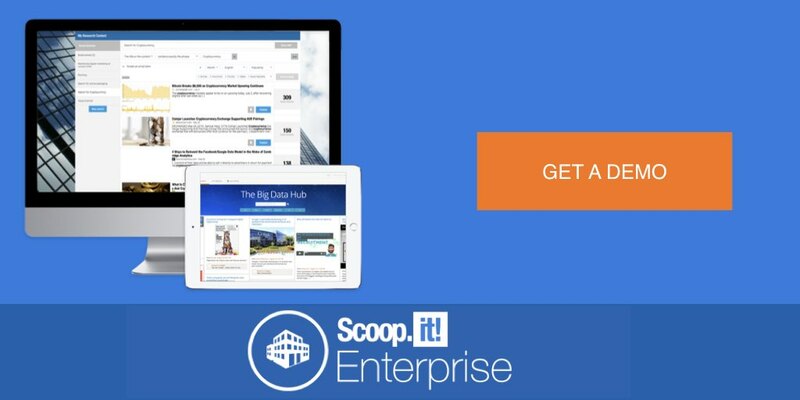 To make this happen, be sure to request a demo of Scoop.it Enterprise and let us show you how you can easily apply this and reap the rewards of collective knowledge. Marijana Kay is a freelance writer for software and marketing brands. She's helped businesses from fast-growing SaaS companies to folks on the Fortune 100 to grow their visibility, authority, and revenue with long-form, actionable content. She evolved from a journalist into a marketer and she's excited to tell brand stories through content. Say hi to her on Twitter!